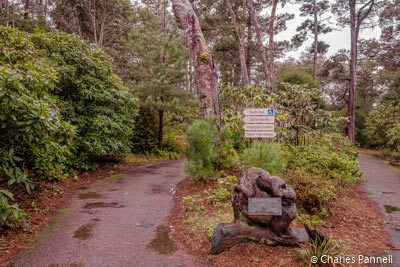 Located along California’s scenic Highway 1 in Fort Bragg, the Mendocino Coast Botanical Garden (www.gardenbythesea.org) is a must-see on any north coast itinerary. Not only does it have one of the best rhododendron collections in the state, but it’s also one of the few public gardens with an ocean view. And although the 47-acre plot is well tended by an army of volunteers, capital expenditures and improvements are hard-won for this small non-profit. In short, they manage every penny they receive in the most judicious way possible, and they try to spend their funds in ways that benefit the community as a whole. Gladly they have made access a priority over the years, which has greatly improved the whole garden experience for wheelchair-users and slow walkers. Previously, one of the biggest access obstacles at the garden was the grade of the North Trail and the South Trail, which lead from the garden entrance out to the ocean. In a word, both trails were extremely steep. That all changed though after some major renovations along the South Trail. Formerly this narrow trail was bumpy, with ruts and other obstacles along the way. It was particularly difficult after a rain, as mud and standing water added additional challenges for wheelers and slow walkers. Access improvements to the trail included widening it, paving it, leveling out the steep spots and adjusting the grade. 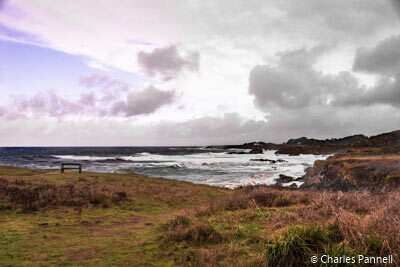 The result is a very accessible half-mile trail that meanders through the forest, and leads out the a coastal bluff which overlooks the Pacific Ocean. Admittedly, there are still some steep trails in the garden — including the aforementioned North Trail — but they are all clearly marked with signs that indicate they are too steep for wheelchairs. 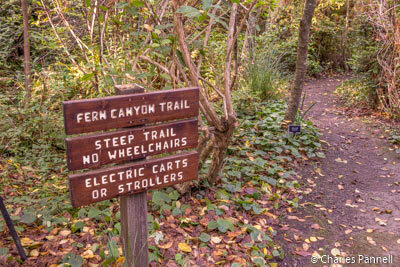 Truthfully the signage is excellent, and it would be nearly impossible to mistakenly take a steep trail. 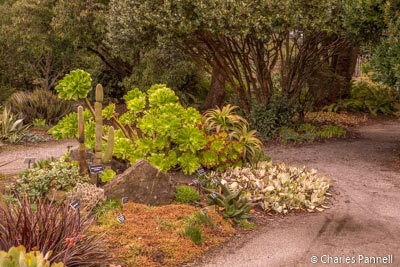 Additionally, there are lots of benches and shady resting spots throughout the garden. Most of the theme gardens — including the vegetable garden, the woodland garden an the perennial garden — also feature hard-packed dirt trails with a level grade. And looking to the future, additional access improvements to the trails will be added as the budget allows. Slow walkers will also be happy to know that there’s a large fleet of scooters available for rent at the garden. Over the years many used scooters have been donated to the garden, and energetic volunteers refurbished them and made sure they were in top operating condition. Additionally a brand new scooter was recently purchased and added to the rental fleet. Today, the rental scooters are available for a very reasonable $8 per day. And when a scooter is retired from the fleet, its life is not over yet. A garden volunteer refurbishes these scooters and they are distributed to local people in need. That’s just one more way that this organization supports their community. Last but not least, another accessible way to enjoy the garden is to take one of many classes that are presented throughout the year. All of the classes begin in the wheelchair-accessible garden room, then move out to one of the accessible garden areas. Current offerings include everything from gopher control and fruit tree pruning, to sustainable vegetable gardening, seed sowing and even rhododendron basics. Classes are priced at $20 for non-members and $10 for members and Master Gardeners. The price also includes admission to the garden for the whole day, so you can learn a few things in the morning, and then explore the garden in the afternoon. That’s a winning — and very accessible — combination, and a great way to spend the day.